Tiny or large, all the kitchens comprise of unused and unnoticeable vertical surfaces. For instance, there is a lot of room to hang your ladles and knives on the side surface of your kitchen cabinets (over the counter). Simply install some rods and hooks to hang those ladles and utilities, thus saving the horizontal plane for storing other stuff. One can even install magnetic plates to house the knives. Similar thing can be proposed in any free wall surface to accommodate the items that cause clutter in the kitchen storage spaces. With the endless space that is required for storage in our kitchens, one of the smart and clever solutions is to utilize the insides of the cabinet doors. Install a series of pockets to hold your bottles or have little hooks to hang pan covers etc. One can think of a lot of things that could make for a great storage space for the cabinet doors. Just a little bit of frugal thinking could lead to ample ways to utilize the kitchen cabinet doors to store things. With the winds flowing in the direction of modular kitchens these days, it is clever to have pulled out units in case the kitchens is considerably small. The pull out cabinets give one an option of layering the stuff, by providing ample storage and also efficient utilization of the kitchen space. 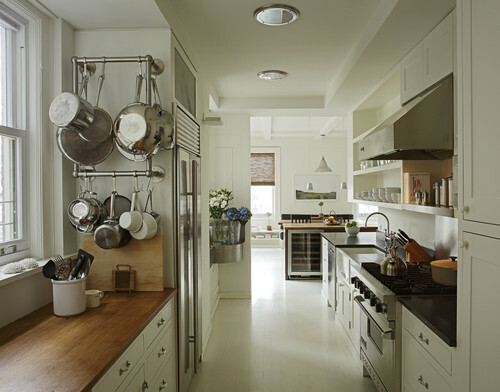 When there is a dearth of space, using the entire kitchen space efficiently is of utmost importance. The benefit with pull out units is – firstly, these accommodate more than the normal shelving unit, and, secondly, these can be pulled out completely to reach the entire stuff easily and at a single glance. One of the cleverest solutions to increase storage space in your tiny kitchen is to add in pegboard(s) on the bare wall surfaces. Pegboards can span an entire wall or a fraction of the surface and can accommodate all things that lack or disrupt organized storage space. Apart from acting as an additional storage space in the tiny contemporary kitchen, these could also be a solution to reach your essentials easily and way faster. Just add in a pop of color in kitchen or texture to your pegboard and bam, you have a statement piece for your kitchen as well. One can club the pegboards with magnetic strips or panels to store things like knives, magnetized containers, etc. to save on the cabinet space. In the dream kitchen, there is an ample space over the counter that is generally left unused or under-utilized. One of the hacks to use this space is by installing rods along the length of the wall and add to it hooks, cans and baskets. These can then be used to keep the essentials, spices, vegetables, cutters, mugs, ladles, so on and so forth. These add-ons, apart from being clever solutions for storage also add in a flavor of zing to your tiny kitchen. Thus making it a plus on storage as well as that needed personal touch. The rods can be installed between two pillars, walls or can be suspended from the ceiling to hang miscellaneous things. These also act as focal points for a tiny kitchen apart from storage areas. Drawers are easiest to operate and the most difficult to maintain. These form a great part of our kitchen storage spaces, therefore it is of utmost importance to use the space efficiently and ingeniously. For the same reason, one can think about using kitchen drawer dividers. The drawer space could be efficiently divided in various ways. One can use divisions according to the cutlery one has or can install pegs or studs according to the crockery size to stack it neatly. This helps in reducing the clutter as well as efficient use of the space. Aforementioned ways are but clever hacks to solve the storage issues in your tiny kitchen. One can either go in for professional help or make it a ‘do it yourself’ project to boost the storage space for all the items in the tiny kitchen. Whatever come may, we are always short on space when it comes to storing the utilities and necessities in our kitchens. This leads to a kitchen full of clutter and confusion. Therefore, to marginally solve the problem, the article enlists clever storage solutions to deal with the dearth of space and create more space on the go. One needs to put on their thrifty hats on to utilize that extra nth inch of a space in the kitchen in an organized and aesthetical manner. After all, a kitchen should look like one, and not give an impression of a storehouse.